Featuring three short stories, an interview, and two essays. Jeff VanderMeer searches for Grey Matter. 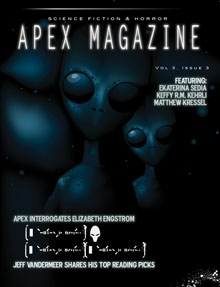 Apex Magazine is a publisher of ‘dark SF' short fiction. What type of dark SF? Think of Aliens, The Thing, and 28 Days Later. Remember reading Russel's The Sparrow? McCarthy's The Road? Gibson's Neuromancer? These are a sample of the modern masterpieces that we strive to reach in terms of quality, social commentary, and thrills. This title was added to our catalog on September 08, 2009.